It is critical to hashtag with a purpose. 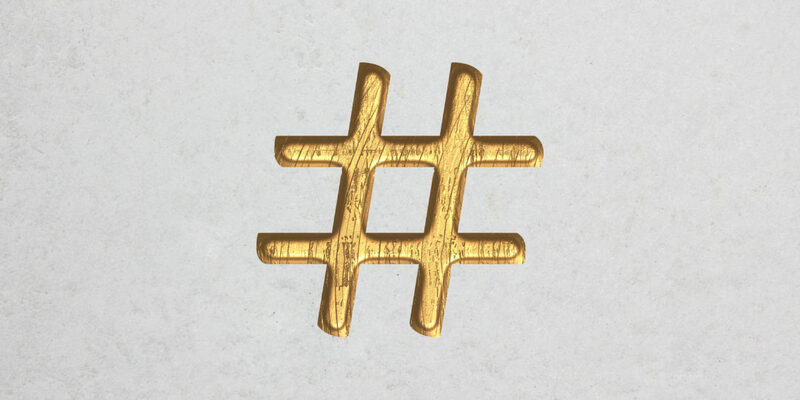 Hashtags are more than just a word with a pound sign in the front – they bring all conversations with the same topic, dictated by the #, into one feed. So, as a simple example, if someone has an affinity for NYC, they can search social media platforms via #NYC and see all posts with that hashtag in one space. Hashtags are a means to expand the number of people a post may reach. Hashtags can also help determine the amount of interest around a topic as the platform will auto-suggest hashtags once you begin to type one and also tell you the usage volume. For whatever reason, certain hashtags trend in shockingly high volumes. If one of these POSITIVELY trending hashtags is relevant to you or your company, then leverage that! This is another way to expand your reach, as well as demonstrate you stay relevant and active. You should keep an ongoing list tracking the success of your hashtags and trending hashtags. Aside from expanding the audience that you reach, hashtags can be used to develop and/or promote a personal or company voice or brand; however, this needs to be done with care. When making original hashtags or using pre-existing hashtags, there are few things to keep in mind to avoid major hashtag fails. …How did reading that go? This is an infamous example of a hashtag gone wrong. Make sure you proof your hashtag and ensure that it cannot be read incorrectly in any way. This unfortunate hashtag faux pas could have been avoided by using capitalization. Make sure your hashtag cannot be used against you in a negative way. Really think about how your hashtag could be twisted because the power of social media is intense, and if something starts trending against you, it may take a little while for the wounds to heal. Avoid, well I’ll just say it, stupid, irrelevant trends. That hashtag is NEVER better. We’re looking for quality, folks. There are many other ways to annihilate your hashtag game. – #if #you #hashtag #every #word #youre #doing #it #wrong. – If you use punctuation in a hashtag, you negate the hashtag. #that’s not what #you’re trying to do. Those hashtags would stop at #that and #you, for example. – Don’t put any spaces in your hashtag. If I want to hashtag my company, it is #LoganAshton, not #Logan Ashton. – Don’t murder your audience with hashtag overkill. If you have a paragraph of hashtags, then you need to quit that #asap. Now that we know what not to do, here are some things you should do. – Make sure your hashtags are simple, short, and easily understood. – Capitalize separate words, when it makes sense, to avoid confusion or an unfortunate oversight (let’s not forget #susanalbumparty). – Place hashtags where they are appropriate. This is often at the end of the post. – Choose the most powerful and relevant hashtags to serve your goal. – Use “long tail” hashtags – this means you should use more targeted hashtags and less vague ones. Sometimes hashtags become too general, resulting in your post getting buried in the feed. Example: #food. – Vet your hashtags and consider them from all angles. – Carefully use hashtags as a means to brand your company, or yourself. – If creating original hashtags, think about if your audience is likely to adopt them or not. – Avoid negative trends, and don’t piggyback on trends irrelevant to you and/or your business. – Constantly check for new hashtags and keep track of the ones you use – social media is ever-evolving. There are some free tools out there designed to help with this. If you’re reading this and kicking yourself for sucking at hashtags, don’t worry – there’s an edit button on Instagram and Facebook and if you tweeted it, people already forgot about your mistake (probably?!). There’s no better time than right now to start engaging in best practices and ramping up your hashtag game. More importantly, if you’re a company and not leveraging the undeniable benefits of proper hashtag uses, call us to figure out what else you’re underutilizing so we can get you on the right track!